A PLE is a learner's gate to knowledge. It can be viewed as a self-defined collection of services, tools, and devices that help learners build their Personal Knowledge Networks (PKN), encompassing tacit knowledge nodes (i.e. people) and explicit knowledge nodes (i.e information). Thus, mechanisms that support learners in building their PLEs become crucial. Mashups by aggregation simply assemble sets of information from different sources side by side within a single interface. Mashups by aggregation do not require advanced programming skills and are often a matter of cutting and pasting from one site to another. Personalized start pages, which are individualized assemblages of feeds and widgets, fall into this category. Mashups by integration create more complex applications that integrate different APIs in order to combine data from different sources. Unlike mashups by aggregation, the development of mashups by integration needs considerable programming expertise. 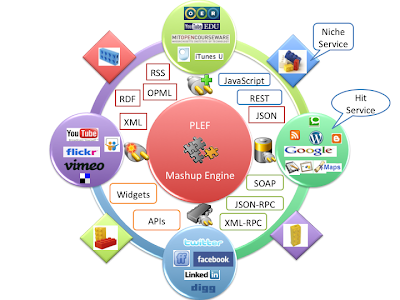 The figure above depicts an abstract view of PLEF, a framework for mashup personal learning environments. PLEF leverages the possibility to plug learning components from multiple sources into a learner-controlled space. This ranges from simply juxtaposing content from different different sources (e.g. feeds, widgets, media) into a single interface (mashup by aggregation), to a more complex remixing of different APIs into an integrated application, in order to create entirely different views or uses of the original data (mashup by integration). Mashups by aggregation seem more plausible compared to integration given the fluid social networking environment I think. How could one entity ever really keep pace with the enormity of the Web 2.0 sphere and the myriad of required APIs necessary to keep something like a mashup by integration up to date? Great post and I love the diagram! Thanks for your comment Michael. Totally agree with you. I think what's possible to do is to develop intelligent mashup engines/editors that can help learners develop mashups by integration with minimum effort.